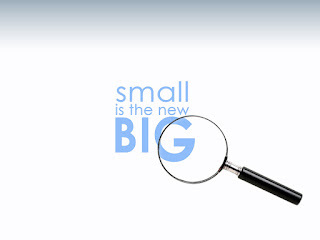 On my computer desktop I have an image which says "Small is the New Big." Each day I come to work and open my computer, I'm welcomed by the friendly reminder that being a big ministry is overrated and that being small is often what counts. "when you're small they want you to be big and when you're big they want you to be small." It's difficult to win. Indeed, when the accomplishment of one goal works against the accomplishment of another (i.e. growing vs. discipling) you wonder if winning is even part of the story or if the victory is somewhere in the process. If we wanna be big, that's fine. But we must be small where it counts. Now, I wonder if we've overemphasized the accomplishment of growing. Of course, this'll sound like old hat to many, but I think the pressure is always more palpable when it comes to growing the ministry, making things bigger, and getting the youth to be more active than when it comes to discipling students and seeing them growing into their identity in Christ. It is rarer to hear of a Youth Worker being demoted, fired, or reprimanded for trying to invest in too many students at once than it is to hear of them being demoted, fired, or reprimanded for failing to grow the ministry. We've got program upon program and book upon book devoted to church growth but it's a lot harder to find (although the resources are out there) help in the area of being present in the lives of just a few students at once. You're just not going to sell many books if your pitch is that it'll help people have smaller ministries. It's just not as glamorous but it's true that, as my desktop background reminds me, "small is the new big." If your ministry is growing, great! but now you've got to find a way to connect with students individually and at a depth that cannot be ventured in a large group context. And you, the leader, cannot do it alone. Your soul is not designed to engage at any depth with more than 6-12 students. Even Jesus didn't try to do more than that. If youth ministry grows out of its britches, if we have too many students for real discipleship, then as we grow larger we're just gonna grow more shallow until the good news becomes nothing more than a fancy show. That's why quality leadership is so important. Eventually it's the small group leaders or the program directors, or whatever you wanna call them (depending on the model you adopt) who will be taking your ministry deeper and doing the heart stuff. That's why, as Mark Matlock said at the Youth Specialties conference, we need more people in the game. And that's why some of us in North County San Diego are taking initiative to invest more into the volunteer leadership of Youth Ministries in our area. We've noticed what Mark has noticed; that churches need more people involved in Youth Ministry. But we also know that most churches wouldn't know what to do if their doors were flooded with volunteers. Most churches have young and inexperienced Youth pastors as it is. Are we to expect them to train and invest in a leadership team on their own? So a couple networks (through the National Network of Youth Ministries) are getting together to offer a free training day for volunteers of churches all over North County--to offer direct access to quality training from experienced and seasoned veterans in Youth Ministry geared toward volunteers for no charge. We think that every network, every community, can do something like this. We know that every county in the country has to have a few veterans whose perspectives would be invaluable to volunteer leadership teams. Now, we know that a one day shindig or anything like it must be just supplementary. There must be ongoing training and empowerment from Churches and Youth Pastors for volunteers. But if we really value relational ministry, if our ministries are going to have and depth, we must empower quality leadership to make big ministries small where it counts.